I’m fairly well fed up with the concept of the triple bottom line. The idea goes that a company or social enterprise can do a good job of ensuring all three of these at once: profits, environmental stewardship, and social good. Bull. As long as profits are in that bottom line, someone will always fudge the other two. “As the terms social enterprise and social business have gained popularity, so has the abuse of these terms. Major corporations have been under greater scrutiny lately and often attempt to hide behind these terms to present an altruistic image. Just as many corporations have employed “green washing” to create an illusion of environmental stewardship as they continue to devour natural resources, some are learning to use “social washing” to combat claims against the social harm they are causing worldwide. So, as you do further research on these concepts, keep a wary eye out for false models. As long as a company or corporation prioritizes a monetary bottom line, social needs will always fall by the wayside. This explains why One Street does not use the term “triple bottom line” i.e., monetary-environmental-social. 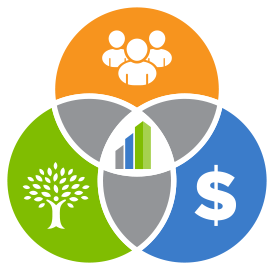 We have found that many companies and corporations that tout a triple bottom line fall short of carrying it through. The monetary bottom line often overrides the other two as companies under pressure to make the most profit seek out the most desperate, impoverished people to make their products, force them to work long hours and pay them the very least they will accept, thus heightening their poverty. The pressure to meet the monetary bottom line also tempts outsourcing to new, more desperate countries leaving a wake of laid-off employees behind. On the environmental side, practices that truly protect the environment, such as replanting trees and reclaiming waste are always more expensive than environmentally destructive practices. With a monetary bottom line included, many companies can only give lip service to the other two. Could you envision running a bicycle program with a single, social bottom line? After Ferguson: Who Owns the Streets?